It’s February already, can you believe it? Soon, Spring will be right around the corner, but in the meantime, February means Valentine’s Day, which means an influx of heart-shaped sweets and pink. I happen to love hearts and pink things, so I’m not complaining. Valentine’s also happens to be the anniversary of my first post on I am a Food Blog. It was a post on Afternoon Beer, a man-i-fied version of afternoon tea. It’s fun to look back at how I’ve progressed photography-wise. And if you want to see even more of my early, early work, check out Momofuku for 2 — sometimes I cringe when I look through it. Even so, I love having a record of what I’ve cooked. Anyway, back to Valentine’s. 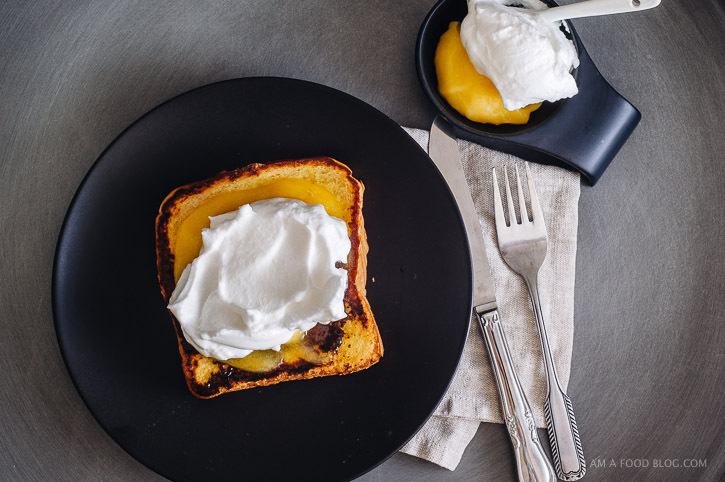 If you’re looking for something fun to make your honey, give this lemon meringue french toast a try. Unless, of course, you have something against raw egg whites. In that case, you can skip out on the meringue, or use whipping cream instead. That being said, I really think meringue is what makes this recipe. 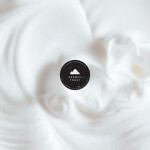 It’s dreamy the way egg whites whip up with a bit of air and the way meringue melts on your tongue – kind of like whipped cream, but with more heft. Can we talk about lemon curd for a second? Wouldn’t you say it’s the best spread out there? If I have lemons and time on hand, I’ll make lemon curd. Forget lemonade — lemon curd is where it’s at. Sometimes, for a treat, I even just eat it straight from the jar. I would probably do it more often, but knowing the amount of butter and eggs that go into a small jar is a little alarming. But who cares about calories — they don’t count when your food is made with love, right? 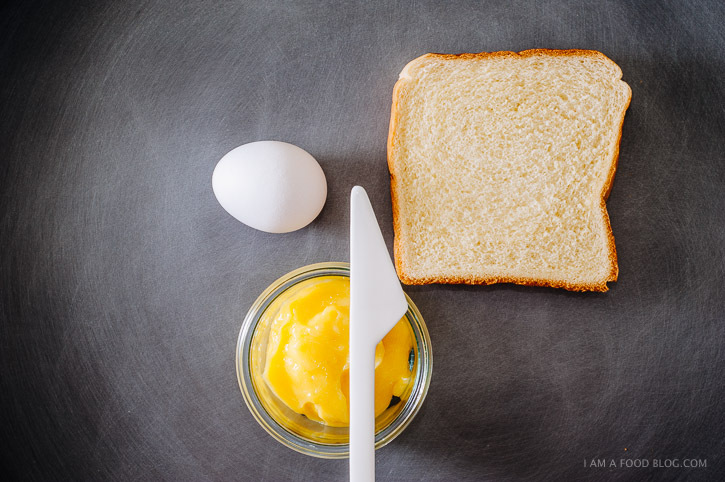 Separate your egg: white in a super-clean bowl free from any grease or oil, and yolk in a shallow bowl. Using a mixer, beat the egg white starting on low speed until the eggs are slightly frothy. With the mixer on medium, start streaming in the sugar, in as thin of a stream as possible. 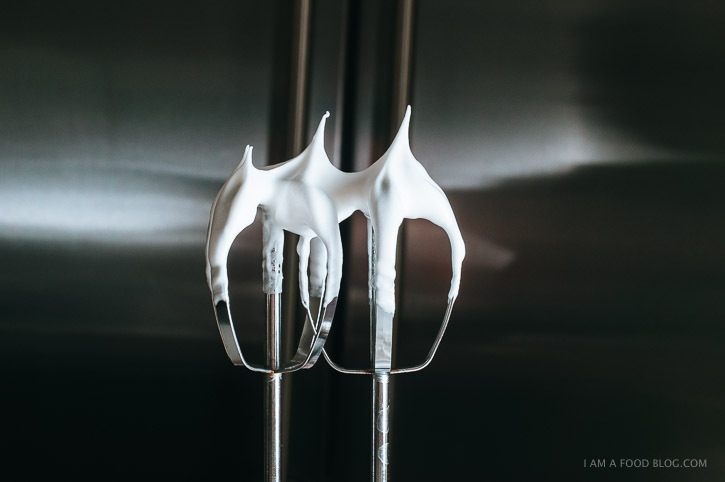 Increase the mixer speed to high and whip until the eggs reach stiff peaks. When you lift your beaters out of the meringue, there should be a distinct “beak.” Set the meringue aside while you fry up your french toast. Whisk the milk into the bowl with the egg yolk. Dip slices of bread into egg mix allowing the bread to soak up the eggy goodness. 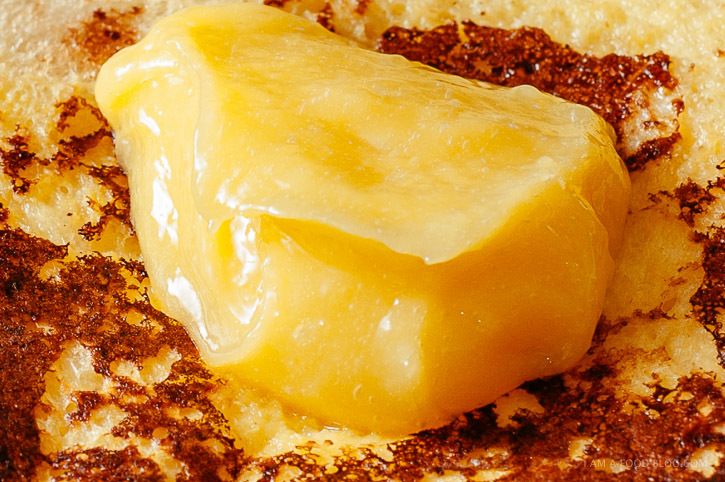 Melt a pat of butter or a touch of oil in a large skillet over medium to medium-high heat. Add the soaked slices of bread and fry until golden brown on both sides, flipping once. Top the slices of toast with the lemon curd and meringue. Enjoy warm! Note: Some people are uncomfortable eating uncooked egg whites. 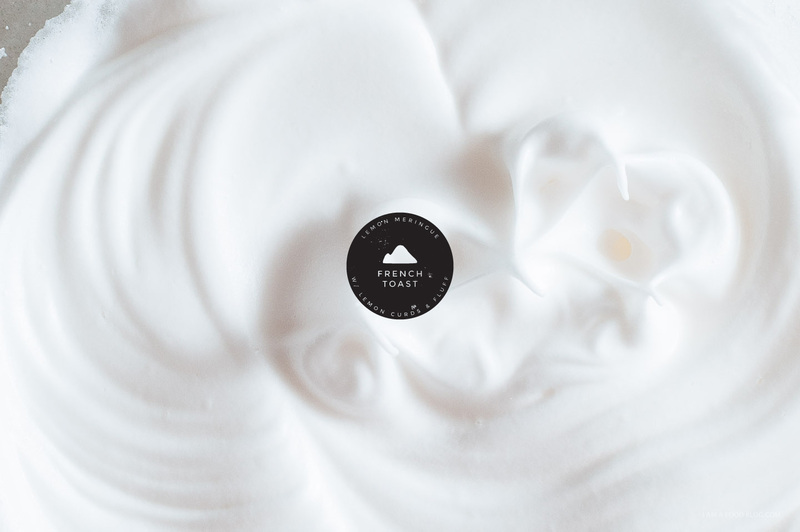 If you have any doubts at all, please don’t eat this meringue! This post made my mouth water. No, it literally made my mouth water. 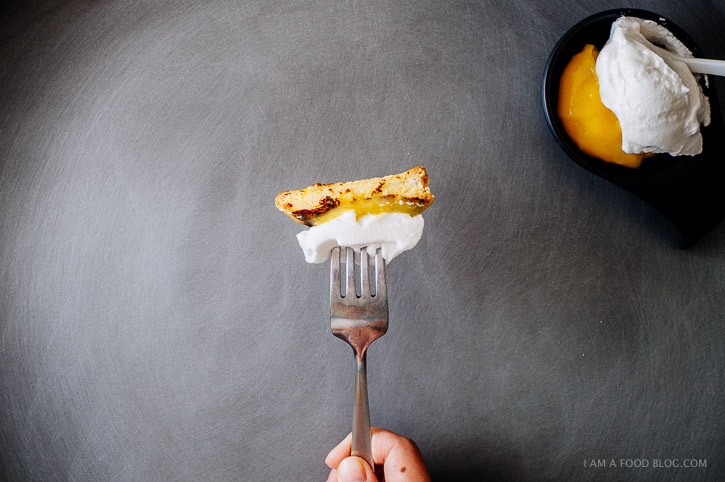 I think my brain so clearly remembers the tangy zestiness of lemon curd and then the divinely smooth creaminess of meringue and… and… crispy edged but soft caramelized french toast… I’m not making an “o” face, I could be, but I’m not. I’M NOT.. Happy valentines! And thank you for this inspiring and delectable post! You are a wonderful human being for this. WHOA awesome! Lemon meringue french toast is possibly the most amazing invention ever. Love your blog, photos and ideas…YUM! I think lemon meringue french toast might just be the best invetion ever. Yum! This isn’t a comment for this particular recipe, just an overall one on the blog: Don’t stop, OK? Your posts are made of wonderful. I can’t believe we live in a world where something like this exists. I’m happy to be living here. Thank you for this. No way! You’ve combined my very favorite pie (lemon meringue!) with my favorite breakfast (french toast, or as “wentelteefjes” as we call it in the Netherlands). I need this in my life. Very, very soon! This sounds like my kind of breakfast. I think I’m in love! This looks incredible, can’t wait to try. I’m quite new to this kind of stuff… So how do you make a lemon curd? If you haven’t made it before and you want to save some time, you can buy a jar of lemon curd at the store. They’re usually in the jam section. Hope that helps! this is like my dream come true!! i love love love lemon meringue and lemon curd is on of my favourite foods EVER second only to potatoes.